CBRE and Rolfe Judd Architecture architectural studio have put together the third edition of the “Modern Office Standards Poland 2016” (MOSP) guide which offers assistance in understanding and determining the quality of the office buildings available on the Polish market. The latest publication contains an update on the technical issues relating to new technologies, legal and market changes, as well as a survey aimed at verifying the class of office buildings (A, C). The ever growing number of office schemes in Poland gave rise to an industry discussion on the subject of the class of the available office space. Development of new technologies, new trends in space fit-out, as well as the growing awareness of landlords and tenants lead to perception of the class of a building as one of the key factors when assessing a scheme. The older editions of the guide were used by developers, consultants, tenants and investors. I am certain that the latest edition of MOSP will become an extremely useful tool for all the players on the market. The past few years and the interest shown in the older editions of MOSP demonstrated how critical the document was for the office property market. The conclusions drawn from it facilitated a discussion on the subject of the quality of the office space offered on the market and they additionally made it possible to better understand the needs and requirements of both tenants and developers. The document enabled us to introduce order into the debate on office buildings and concentrate our attention, i.e. the attention of the parties involved in execution of office schemes, on the most important elements deciding on the quality of the space created within. The great interest shown in it and the evolving market needs prompted us to prepare the updated version of MOSP. We believe that it will continue to be of good service to you. 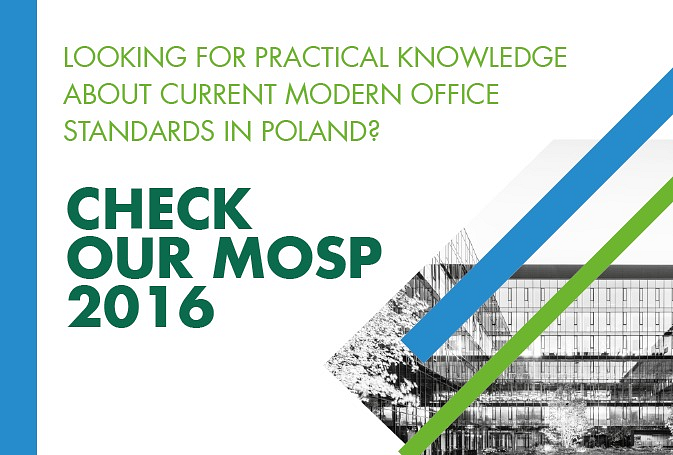 This year’s issue of the “Modern Office Standards Poland 2016” guide is its third edition. The publication has been created as part of an exchange of experiences and views between CBRE and Rolfe Judd Architecture. There have been a number of discussions carried out with the entities operating on the commercial property market (developers, landlords) in order to set the determining criteria. This tool will be of particular assistance in controlling costs and quality as the specification of a building can be agreed upon at an early stage of the planning process. Please find the full version of the report here.